The apartment has a bright and airy lounge which has a large patio doors leading out to the balcony, from which there are amazing views of Kalkan bay. The lounge has comfortable seating and a TV & DVD player. The kitchen is fully equipped with built in washing maching and fridge/freezer. WIFI is available throughout the property (access details provided on arrival). The master bedroom has an en-suite bathroom and offers direct access onto the sun terrace and the swimming pool. The terrace offers views of the bay. The apartment has a further double bedrooms are located on the ground floor. Also there is a large shared swimming pool with ample sun bathing area. En-suite to the master bedroom with shower / sink / wc. Plus a further bathroom with shower / sink / wc. The living room has direct access to a balcony with views of Kalkan Bay. Furniture includes a large corner sofa, coffee table and a dining area. Equipment includes WIFI, TV, satellite receiver, DVD and music system. Fully equipped kitchen with cooker, hob, extractor fan, fridge, freezer, washing machine, microwave. Notes on accommodation: The apartment is fully air conditioned. There is a staircase leading down to the two additional very large double bedrooms. The property also has free WIFI internet access. Outside: Barbecue is available by the pool. Outdoor furniture for use by the pool is provided. Utility Room: Ironing board, sun loungers with covers plus sun umbrellas. Cleaning / Towels / Linen / Maid service: Clean towels (including beach towels) and linen are provided. These are changed weekly. This is a spacious apartment laid out over 3 floors with plenty of room for 6 people. It is built in to the side of the hill so when you enter you are on the top floor where the kitchen and lounge are. The next floor down has 2 bedrooms, one with an en-suite and access from both rooms onto the swimming pool. The next floor down has another bedroom and bathroom. However whilst the bedroom was huge the whole floor was dark and not very pleasant and thankfully we didn't have to use it. There were another two rooms which were undecorated and if they had been this could almost be turned into a separate apartment. Kisla itself is very quiet and beautiful with a few good beach clubs. Bob's restaurant and small shop is a short stroll down the hill. Food is good but they are unable to cope with more than 3/4 tables of people. The apartment is beautiful, the pictures don't do it justice, especially the pool which was a perfect size! The rooms were very spacious and comfortable. We really appreciated the welcome pack, great as we arrived in the very early hours of the morning! There was a power cut whilst we were there and Hamza arrived within 10 minutes and sorted it for us immediately. The views from the apartment were fantastic, and Kalkan itself is definitely a place to visit, with fantastic restaurants and shops to wander around. We are already looking into coming back next year as there is so much more to explore. Many thanks to John & Hamza. 3 of us stayed in the apartment for 7 nights and the accomodation was spacious and of a decent standard. The apartment is on two floors and the lower level is huge and could also be a seperate dwelling. The apartment is on the ground floor of block of flats, where i think there are 3 or 4 in the building. We weren't bothered by anyone else and had exclusive use of the swimming pool, via the door from our bedroom. The pool is large and at least 4 times larger than what I saw in the neighbouring villas. We had an issue with the wifi there but the problem was fixed within a day so this was also good. We had a car there which was good, as its about a 3 min drive into the Kalkan town, but the position of the apartment is superb. The beach club is 5 minutes walk from the villa. The beautiful Patara beach is only 15 minutes away by car / taxi. 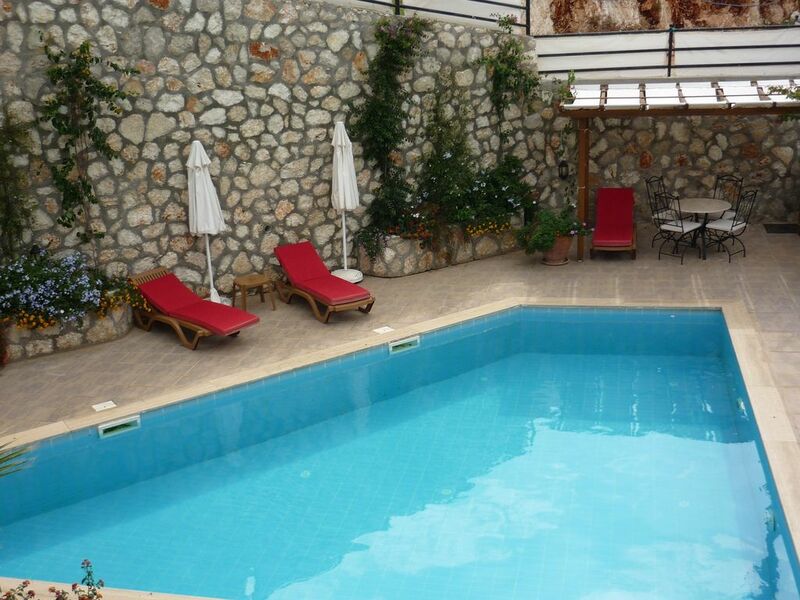 Kalkan beach is a short walk or 5 minute boat taxi ride away. Dalaman airport is 80 minutes away. Booking Notes: Please contact owner. Changeover Day: Changeover day is flexible. Notes on prices: Prices are for the property per week in UK Pounds.